The entire team collaborated on the concept development for this project. Coryn and I worked in tandem on the UX for the app, Personas, and User Journeys. 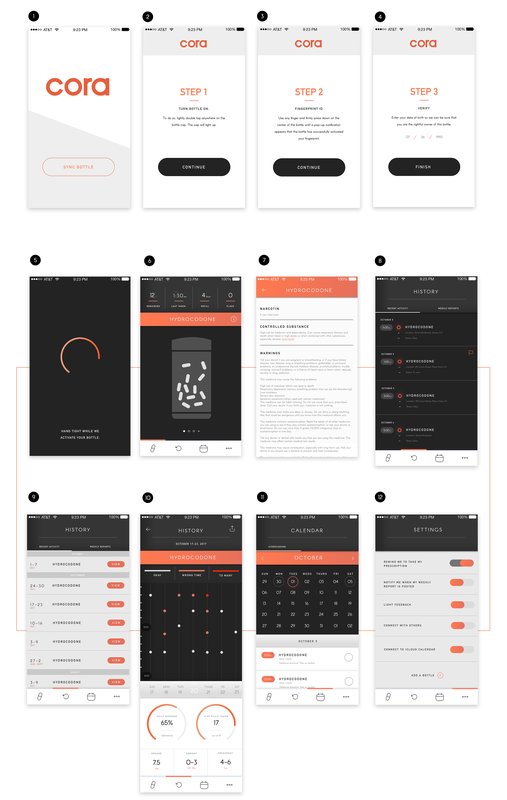 Individually, I created and 3-D modeled the bottle and visual mockups for the bottle itself while also creating a barebones prototype of the app for use in the concept video. They say that home is where the heart is, but my home is a much more dire place than I'd like to imagine. Martinsville and the surrounding Henry county maintain the number 1 spot on the list of opioids prescribed per capita. The population is only 13,645 as of 2015. Innovate. Create something that could be used to help. I know that I can't solve the whole crisis, but this could be a start. Our team started with the goal in mind of trying to solve the big problem. What could we do that could fix the opioid problem? We quickly learned that the crisis as a whole was much larger than any one solve could help, and instead narrowed our focus on a much smaller issue that could serve as the stepping stone into solving the larger problem. That problem is opioid security and patient accountability. This is Cora	The smart bottle designed specifically to gather data and provide usage information to both patients and their doctors safely and non-intrusively. When first entering the App, users are welcomed with the option of attaching their new smart bottle to the interface. Users enter a simple four-step process that includes powering on their device, setting their fingerprint lock, and agreeing to the terms and conditions regarding data collection. Like what you see? Give me a shout!